What a card and what a night is lined up at Churchill Downs. The great Justify will head to the paddock and parade for the fans there and then make a guest appearance on the track. In addition, Churchill Downs will play host to the G1 Stephen Foster Stakes and four other Graded Stakes events before the night is through. 1st: 2-4-3-5…Behavioral Bias (2) looks awfully tough in this spot tonight. The 4YO Shackleford gelding is coming off a near miss second to the classy McCraken here on May 5. Only lost that one by 1/2 lengths and has hit the board in six of the last 7 tries. Has a win and two seconds in just four races here, and picks up one of this meet’s best riders in the saddle. Thirstforlife (4) ran away with a win last time out here on May 19 and has either been first or second in the last seven races. Picks up one of the coldest riders in the country right now, but this one has the game. Pioneer Spirit (3) has hit the board in 11 of 13 career races and had a nice front-running win at Aqueduct on April 2. Has never been here, but he had a super work over this track on June 9 and goes for a top trainer in these parts. Beware. I bet the 2 to win/place/show and then box the top 3 in one exacta. I key the 2 over the rest in a smaller version. 2nd: 1-7-5-3-2…Girls Know Best (1) has won two in a row and three of the last four races, including a Stakes event at Pimlico on Preakness Day. This one loves to be on or near the lead and gets a rider who won with her just two starts back at Keeneland. Super works at Keeneland on June 7. Looks ready to fire again. Just a Lady (7) brings some value to the table at 5-1 ML odds, and she has a shot here. Ran fourth, but beaten less than 3 in the Unbridled Sydney Stakes here on May 12 and was wide in that one. Has hit the board on 8 of 14 tries at this specialty sprint distance, and has a win and two seconds in four tries here. Knows the course and should be rallying from just off the pace late. Ruby Notion (5) picks up a top rider for this one and will go for the new trainer for the second time. Has not been close in the two Stakes raes of late but did win here on June 9 of last year. Looks like she could be a menace late, with a clean trip. I bet the 1 to win/place/show and then box the top 3 in one exacta. I key the top 3 over the other two in a smaller version. 3rd: 4-9-2-5-8-3-7-1…Own Agenda (4) got the Lasix for the first time last out and it looked like it made a difference, as he closed well to be second to a nice winner in Home Base. Has come back to work very well here — including both May 15 and May 28. Gets a top jock on board today and looks primed for a top performance. Kearny County (9) was beaten just a neck last time out and looks to be improving mightily with every trip to the racetrack for a trainer known for taking his time with his youngsters. This one returns from a race where he was the beaten favorite, and the trainer hits with .28% of those kind. Looks like the one to beat here. Making a Marc (2) has run five previous times with 3 seconds and a third. Throw out the debut race on the grass, and this one has never been beaten more than 2 lengths. Super work her on June 11 in the mud. Looks primed. I bet the 4-9 across the board and then box those two solidly. I key those 2 over the rest in a smaller version. 4th: 4-5-8-1-3-10-7-9…I key on the top three numbers in this sequence, led by Blessed Union (4). this 3YO filly by Union Rags is coming off a third when the race at Arlington Park was moved off the turf. Now, she gets back on the sod and has a nice work since the race. She has been on the board in the last three tries and gets a new rider for the first time today. Watch out for this one at some decent odds. Love to Share (5) has two thirds and was disqualified from a win in between. Hot rider has a 3-2-2 record in the last 11 over a week’s time, and the trainer is having a nice meet this Spring/Summer with .21% winners. Ipanema Beach (8) has been close three times and every time that she has not been put in a Graded Stakes event. Had a super nice work at Keeneland on June 10 and looks like she may be the one to beat here with the meet’s top rider getting up for the first time. I bet the 4-8 across the board and then key the 4-8 over/under all the other numbers listed in the exactas. 5th: 7-5-4-6-2-1-3…G3 Matt Winn Stakes…I go with the odds-on favorite and maybe the second best horse in Bob Baffert’s barn at Churchill Downs in this spot — Ax Man (7). He has won three of four races to date, and done so impressively and by a combined 243/4 lengths. He ran away with the win in the Sir Barton at Pimlico in the slop, but more impressively easily dusted (wrong word on that track) Prince Lucky — who since came back to win a Stakes event at Belmont Park on Belmont Stakes Day. This one has speed to burn and looks like he may run away from this group early and often. The best option to beat him, IMO, is Combatant (5). He was last seen running 18th in the Kentucky Derby, after an awful start. Before that, though, he had never been worse than fourth in 7 other starts and has been pounding heads with some of the division’s best all Spring. He will come running late, in case someone can soften up the top choice. King Zachary (4) is a talent runner by Curlin and trained by Dale Romans. Won impressively here on Derby Day in the slop, and I would expect another giant stride forward tonight, as well. Another who will try to make one run late to give Ax Man some company at the wire. I bet the 7 to win/place and then key the 7 over/under the 5-4. I key the 7 over (only) the rest of the numbers. 6th: 4-2-1-5-8-6-3…G2 Wise Dan Stakes…How in the world do you go against the defending Champion in World Approval (4), who will be getting his first start since running 5th in the G1 Kilroe Stakes at Santa Anita back in March? Before that, he won four in a row and 6 of 7 — including three G1 events and the Breeders’ Cup Mile. He will be reunited with former rider John Velazquez in this spot, and he was up for three wins in a row before the last race debacle. Looks primed and ready for this one, although it will be at the 11/16-mile distance. Well, I try to beat him today with my Upset Special — Shining Copper (2), at 6-1 ML odds. This one used to be a rabbit for the Ramsey Family and trainer Mike Maker. He has become so much more He has 5 wins and two thirds in just 8 tries at this distance, and has a 1-1-1 record in five starts on this grass course. Tired over a yielding track in the last out, but the trainer hits with .22% of those coming off this kind of a layup, and he had a super work on June 9. My pick. Divisidero (1) loves this turf course with a perfect 3-for-3 record over it. But I don’t love what this ownership team did to trainer Buff Bradley — who just so happened to win the G1 Woodford Reserve Turf Classic for them on Derby Days twice. Twice, mind you. Kelly Rubley may be a nice guy, but I can’t root for this horse any more. Period. I bet the 2 to win/place/show and then box the 4-2 in one exacta. 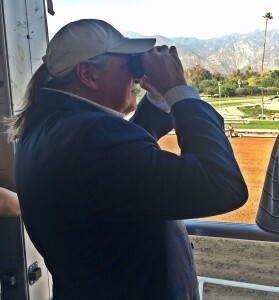 I key the 4-2 over the rest in an exacta part-wheel. 7th: 7-5-3-6-8-1-9-2…G2 Fleur de Lis Handicap…Valadorna (7) got back to her winning ways on April 20 in the G3 Doubledogdare Stakes at Keeneland. She closed very well that day to get the win and run her career earnings over the $500,000 mark. She has come back to work well over in Lexington, and looks to be every bit as good as the 3 wins in the last four races may suggest. The one to beat. My choice, though, is Song of Spring (5), who won the G3 DuPont Distaff at Pimlico in her last start, storming from well off the pace to win in the slop. If you will remember, the track was favoring speed all day and this one was the only one to close and win. Despite the bias, she looked tremendous and she can run over a fast track, too. Has hit the boar in the last four and looks really good right now. Blue Prize (3) was nipped at the wire by our top choice in the last. This one has plenty of speed, and likes to use it early. Nice works at Keeneland of late, and looks ready for this tilt over a track where she has a win and two seconds in just three starts. I bet the 5-7 to win/place/show and then box the top 3 numbers in the exacta. I key the top 3 over the rest in a smaller version. 8th: 6-8-2-4-1-9-7-3…G1 Stephen Foster Stakes…Backyard Heaven (6) may be the next great one to come from the barn of Chad Brown. This one ran away with an easy 41/2-length victory here on KY Oaks Day in the G2 Alysheba Stakes. Before that, he won in March at Aqueduct and that came on the heels of a win in New York in December. Training super at Belmont, especially on June 10. Has the speed to roar early and I look for the jock to do just that. Irish War Cry (8) has never put two really good races together in a row, and has made a lot of betters and supporters cry in the past. But the win in the G3 Pimlico Special over a sloppy racetrack on Preakness Day gives one hope that maybe, just maybe, he has grown up and better. I think he has the talent to blow this field away. Will he? Time will tell, but I’m going with talent. Patch (2) is another former KY Derby runner, who managed to be 14th in 2017. Has run only once this year, and he won that from off the pace at Belmont Park on May 12. Will have top pick up his game tonight, but looks fully capable for a top barn operation. The jockey opts to ride Uncle Mojo (4) instead, though, and that’s bothersome. I bet the 8 to win/place/show and then box the 8-6-2 in one exacta and the 8-6-4 in another. I key the 8 over the rest of the numbers in a smaller version. 9th: 11-13-8-10-6-3-5-12-2-4-7-9-1…G3 Regret Stakes…Obviously, by the looks of that string of numbers, I think this is a wide open race. And it surely is. But I will focus most of my attention of the top 3 selections and work off them. Romantic Moment (11) did not get any favors with the post position draw, but she is very talented and has speed to utilize early if she can get away from the gate cleanly. Since moving to the grass, she is undefeated and she was ultra impressive over a yielding track at Keeneland in April. Top rider returns. Stave (13) is even farther outside, but she took has the class and speed to be able to get over at the start and save ground with a clean break. Two wins in a row have been ultra impressive and she continues to work nicely for this one. Will make the Stakes debut tonight, but looks ready for a trainer who wins with .27% of those coming into a race off a victory lap in the winner’s circle. Beyond Blame (8) is a real talent who was compromised greatly in the first turn of the G3 Edgewood Stakes here on KY Oaks Day. Do not be surprised or shocked if she runs much, much better today with a clean run and I expect her to do just that. I bet the 11-8 to win/place/show and then box the top 3 numbers in the exacta. I key those 3 over the 10-6-3 in a good one. And, I key the top 3 numbers over th 5-12-2 in a saver oner. 10th: 1-6-3-2-7…Other than Ax Man in the Matt Winn Stakes, I think this is the next, best “dot” play of the day right here in Honorable Treasure (1). Has two straight seconds that very easily could have been wins. Went 5-wide in the last, and only lost by 1/2 lengths. Was bothered and blocked in the one before that and still was beaten less than 2 lengths in the one before that. If the rider will get this one a clean trip, then he has a big shot to move on with a huge run tonight. My Best Bet. I bet the 1 to win/place/show and then key the 1 over/under all the rest. 11th: 3-4-1-6…A rather weak group to close out the night’s activity, and I will go with My Eminence (3), who gets dropped to a career low level for this one tonight. Finally broke the maiden in race 17 with a win at Keeneland in a high-end MC event. In 18 tries now, he does have 6 seconds and 3 thirds. So, all the betting has to run through this guy. I bet the 3 to win/plae/show and then key the 3 over/under the “all button” in one case and then key over the 4-1-6 in another.